Dubbed as the event of the generation that never happened, the unfolding story is not about the dueling documentaries—Hulu’s Fyre Fraud and Netflix’s FYRE: The Greatest Party That Never Happened. It is about what the learned lessons on how well-thought-out digital marketing strategy, in particular, a social media marketing campaign can propel great success and how it can also lead to the campaign’s own doom. Indeed, before it became a hot documentary topic, Fyre Festival is poised to becoming the next important digital marketing success. In fact, it is; it was. It really became a source of digital marketing envy, until the debacle. Co-founders Billy McFarland and JA Rule talked about the Fyre Festival starting with a web summit where they discussed the gaps in booking talents and artists. It was followed by a series of digital activities, particularly in the social sphere. The Fyre Festival was announced on January 12, 2017, through a video that promises a “transformative experience” on a private island. The messaging was clear. It was the promotional video that got everyone talking. Why not? It features the Top 10 supermodels. The use of models signals the Festival as luxurious and glamorous. The YouTube channel with the same name was launched on the same day. The organizers tapped the services of Jerry Media, a social media marketing company. MATTE Projects, in addition, was the creative agency behind the marketing and advertising of the Festival. Official social profiles, aside from the websites, were created. A Facebook page was created on December 10, 2016. The launch day was set on December 12, 2016, wherein various social media personalities and other celebrities would post an update about the Festival at exactly 5:00 pm. Subsequently, Instagram feeds are bombarded with ambiguous burnt orange tiles. Of course, an official hashtag #FyreFestival was used for the campaign. Thus, they–the people behind Fyre Festival–dubbed it as the “best coordinated social influencer campaign.” The marketing agency tapped on the influencer culture to get their message across. And yes, these messages transcend beyond the digital borders into a real-world debacle. Influencer marketing proved to work too. Celebrities used their Instagram accounts to partake in the promotions. On December 12, 2016, high-profile celebrities including Kendall Jenner, Bela Hadid, who had already apologized for her participation in the promotion, and Emily Ratajkowski ‘hyped’ the Festival. The PR storm ensued. It was reported that Jenner was paid $250, 000 for an Instagram post about Fyre Festival. She even offered a promo code. The post has now been deleted. Analysts and skeptics considered Jenner’s post as one of the defining moments of the success of the Fyre Festival campaign. Tickets to the “cultural experience of the decade” sold out within 48 hours, proving the power of celebrity. Jenner belongs to the first wave of influencers, however. The second wave included vloggers, bloggers, and other prominent personalities. Brand sponsorship forms part of the influencer marketing, the goal of which is to create a buzz. Capitalizing on FOMO or the fear of missing out that characterize the millennials, the Fyre Festival campaign was able to target the right audience with the right messaging. An Instagram post gave these influencers access to a one-night, three-person villa stay within the island. A dedicated website, http://www.fyrefestival.com, was developed for the sole purpose of the campaign. Another site was utilized to post updates, fyrecay.com, also went live during the campaign. 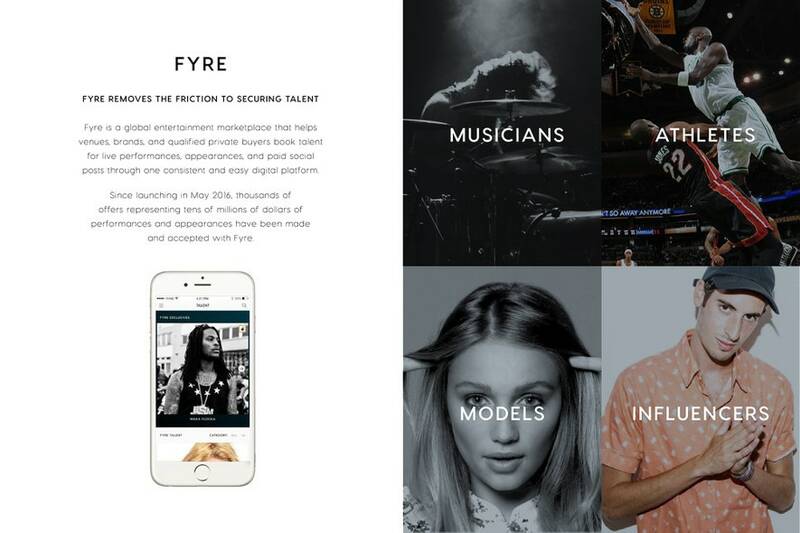 Let us not forget that the Festival was planned to promote Fyre, a music booking app produced by Fyre Media. A seemingly promising app, dubbed as the Uber of booking talent, it can be used to book talents and performers straight from the app. AI (artificial intelligence) technology was also part of the portfolio. As planned, each attendee will be issued a smartwatch, an RFID bracelet, that can be used for in-island transactions. Weeks before the actual event, the social media was on a frenzy because of the speculations, and yes, more red flags. Comment censorship occurred. A Fyre Festival representative deletes negative comments about the Festivals and its organizers. On the day of the supposed event, a blogger, Seth Crossno, live-tweeted the incidents as they unfold. In March 2017, a Twitter user with the handler @FyreFestivalFraud was created to publicize updates and answer questions both from the event attendees and prying public. In wake of two documentaries and several lawsuits, the influencers were the subjects of the memes now. The documentaries threw the influencers on the spotlight now for good and bad reasons. If for anything, what the Fyre Festival digital marketing campaign proved is that the power of influencers is real. Although, according to Influencer Marketing Hub, it cannot be considered as a success. In fact, influencer marketing can be a potentially dangerous tool that may lead to a marketing disaster when abused. In a BBC article, however, the campaign shows how influencers can produce the largest ROI across the board. Interest about the topic influencer marketing has increased over time. But it still boils down to publicity. Both brand managers and influencers have to tread more carefully now. PR is PR after all. As what Whoopi Goldberg of the View has said, this is a cautionary tale for the social media era. It is. Social media are at the mercy of the brands that wanted to manipulate and control the platforms and their users. The marketing behind Fyre Media was able to optimize social media, almost weaponize them to their advantage. This is not what social media marketing or influencer marketing per se intends to do. Far from it. Looking at it closely, social media was the Festival’s primary tool as well as the cause of its downfall. With that said, here are the key takeaways from this digital marketing fiasco. Luxury was the primary keyword used by the campaign to please the crowd and entice the people to purchase the tickets with hefty selling prices. The most coveted tickets then were available from $500 to $12,000. Since Instagram was mainly used, it concocted the idea that the Festival is an Instagram fantasy that may come to life right in front of you. So people dig in. People could have been more diligent because, from a digital marketing perspective, the promotional materials were the biggest red flag. The Fyre Festival was quite ambitious; it is not feasible from a marketing perspective. A festival of this scale would take years to plan, and yet the public–mostly millennials– took heed and made the purchases only to find themselves in the middle of a chaotic situation. For the brands, it means making achievable promises and performing and delivering on them most efficiently and effectively. Forget about the hype machine. It would be nice to go viral for all the right reasons than the wrong ones. Dishonest content may ruin your brand reputation, so stay from away from this. If you can get real about the products and services you sell online, the better. More so when you are sourcing help from the influencers. Part of being authentic is skipping the calls to action. No brand should strive for making their Facebook page a big shopping mall. You can offer your audience more than a quick sale. These are the posts that meant to connect with them. Striking a balance is the key. Also, if you can, create positive brand moments. The best updates are those that make the target audience as if they are part of the brand. Advocacy, anyone? The social media and other digital platforms that can be used for any campaign (i.e., websites and blogs) are a place for interaction. But this can have limitations too. Mistakes, for example, are damaging to the brand. However, as a prudent organization, you need to acknowledge the mistake and correct it. Own it, then don’t do it again. Deleting is not an option. Fix it instead. That’s how you humanize the experience. If the blunder is too serious, consider a crisis management. A PR mode is crucial at this point. Whatever happens, do not pretend like it never happened. Otherwise, it would result to more serious problems later. On that note, do not be another digital marketing fiasco to the Fyre Festival level. More so when you started too strong. Always calculate the risks of what you post on your social media platform. The Fyre Festival social media marketing is how you do social marketing. However, as a brand, you need to deliver on your promises, be honest and transparent, and practice diligence at all times. Optimind Technology Solutions is a digital marketing agency, offering services from video marketing to social media marketing.